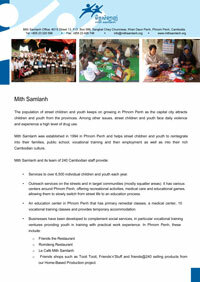 ­Mith Samlanh Annual Report 2009. Click here to download. ­Mith Samlanh means ‘Friends’ in Khmer. Mith Samlanh is a Cambodian non-governmental organization that runs programs for street children in Cambodia, working with up to 1600 children and youth every day. We are non-religious and non-political. Click here to download. Cambodia has a remarkably young demographic structure with 44.3% of the population under 18 years of age1. A combination of severe decimation of the population during nearly three decades of war and civil confl ict, a post-war boom and the low average life expectancy of 57 years2, are reasons behind the unbalanced population emography. Click here to download. Between July 2004 and March 2006, Mith Samlanh, a Cambodian local NGO, and FosterCare.no, of Norway, developed a pilot project for placing orphaned and abandoned children into new family homes: Foster Care. In Cambodia, this is currently the first project of its kind where individual children (or siblings), whose parents have died or abandoned them, are placed with another family, unknown and unrelated to the child. Click here to download. Placement and reintegration of any vulnerable child, who has for whatever reason lost contact with their family, is complex enough. When HIV/AIDS is brought into the equation the task can seem, at times, impossible. There are a multitude of reasons why children loose ties with their family and/or society in general and there are therefore many factors to consider when supporting them back into mainstream society. Click here to download.